Home » OOTD » I'M BAAAAAAACK! Hello there lovely followers/readers! I'm back from my dreadful a levels exams and I feel alright about them, I revised loads (and complained about it via twiter, sorry about that haha) and I think it went alright. I'm not an exam kindof person, they stress me out! I have bought so many things in the past two months that I just haven't gotten round to showing you, so I thought I'd do two outfit posts. Now the bag is not really a knockoff, but more an 'in the style' of the alexa bag by mulberry. I love the style of the bag and I love that this is alot lighter than the original as its matches my brogues perfectly! The vintage dress is absolutely amazing, it has a beautiful shape to it and the brogues are just another addition to my overflowing collection of shoes. What do you think? 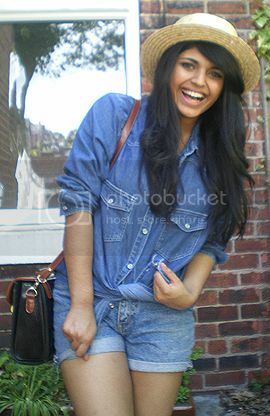 Next brings two of my favourite trends together - Double-denim & Boater hats. 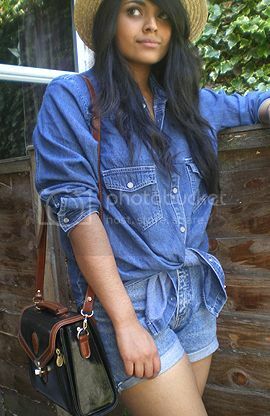 I actually love the double denim trend even though it is very much a crime against fashion. 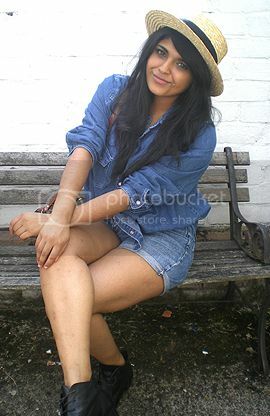 The boater hat makes me feel like an old granny, but I love the trend that's going round with it at the moment! What are your views on these? I've splashed out quite abit recently but I am officially broke again. Oh well. I'm pretty happy with all my new purchases, especially the high waist shorts. They go with EVERYTHING. DON'T WORRY! I'm having another (amazing) contest soon.. so seriously stay tuned! New post soon, that is very much a promise! 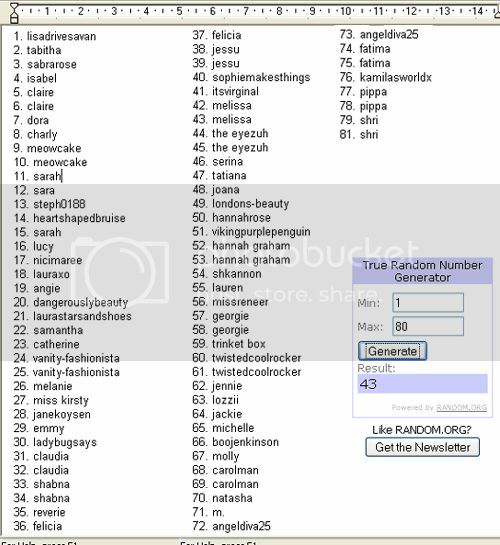 Sorry it took so long to announce the winner and sorry I've just not been around, I know I've actually had a good excuse but I feel bad.. my blog and your comments literally just makes my day! The fact that people take time out of their day to sit and read my crazy posts is abit strange, but very flattering! And now there are 450 of you lovely followers (I know, crazy right?!) I will make sure I post regularly! Hope you are all well, I've got an event in London coming up wednesday and I'm back to school thursday, but because of the London trip I'll probably be back on friday. Never thought I'd be so happy to go back to school.. at least I've not got any exams! P.S. Please note my new little headers in the sidebars. The reading list is a list of books I want to read over summer, most of the re-reads. And the lovely shops is shops I like online. Don't worry, they aren't sponsors, just my personal favourites! If you have any books you think I should read or little online shops I should check out, please let me know!